Florida used a barrage of 3-pointers in the second half to beat Arkansas 80-65 Saturday at the Stephen C. O’Connell Center to extend its winning streak to 10 games. Sophomore guard Nick Calathes led the Gators with 28 points, 10 rebounds and seven assists. Calathes made four 3-pointers in the second half and finished with a career-high six three-pointers, clearly the difference for the Gators. Arkansas outscored Florida in the paint, but the Gators made up for it from long range. The Gators were 3 of 17 from 3-point range in the first half and led 37-34 at the break. They were 8 of 13 in the second half, opening a 17-point lead and spoiling Arkansas coach and former Florida assistant John Pelphrey's return to Gainesville. Freshman guard Erving Walker chipped in 13 points, including three baskets from behind the arc, and sophomore forward Alex Tyus added 11 points and six rebounds. Sophomore forward Chandler Parsons and freshman center Kenny Kadji each finished with 10 points. Tim Tebow, Urban Meyer and other members of the Gators' 2008 BCS Championship football team made an appearance at halftime. A special performance by the Dazzlers included the Golden Gators. Crowd favorite "Stick Man" performed during each half. 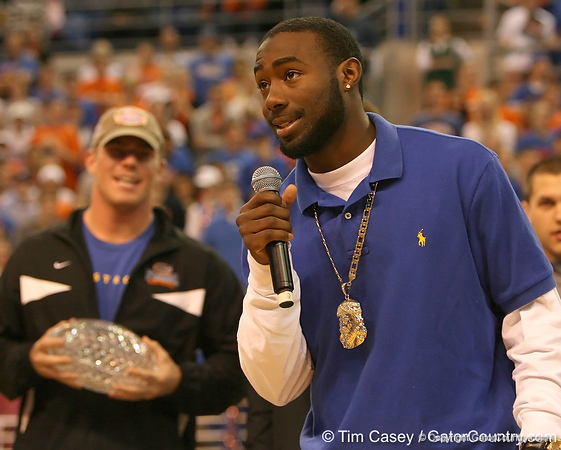 Florida redshirt freshman running back Chris Rainey addresses the crowd during halftime of the Gators' 80-65 win against the Arkansas Razorback on on Saturday, January 17, 2009 at the Stephen C. O'Connell Center in Gainesville, Fla.